‘Its only another 10 minutes to the top!’ the Irish couple tell us. They recognise us as Brits, and have seen how shattered we are looking, and are trying to encourage us. They are on their way down from the top of Montségur and we are on the way up. We seem to have been climbing the steep pathway for ever … and 10 minutes later we are still climbing … with still no sign of reaching the top. Perhaps our encouragers were still on Irish time rather than French time, and therefore an hour behind?! ‘Whose bright idea was it, to climb to the top of Montségur?’ I mutter breathlessly to Julia. ‘Yours!’ she reminds me. One of our main reasons for coming to this part of France was to visit Montségur. I have been fascinated with the story of the Cathars for several years now. I first came across these 11th to 13th century ‘believers’ through reading Kate Mosse’s books Labyrinth and Sepulchre, and began to research them academically as a result. They were particularly strong in the Languedoc region of France until their repression at the hands of the Roman Catholic Church and the King of France during the 13th century. For the Roman Catholic Church the repression of the Cathars (or Albigensians, as they are sometimes known) was necessary in order to maintain the ‘purity’ of the Church doctrinally. For the King of France it was primarily a political move, an opportunity to annex vast new territories for the French estate. Cathar doctrine originated in a labyrinth of complex Eastern influences, prevalent in Europe, during the 11th and 12th centuries. Cathar teaching focussed on the opposition of ‘Good’ and ‘Evil’ differentiating between the ‘material’ world (created by the Devil) and the ‘spiritual’ world (created by God). Obsessed with a repugnance of evil, the Cathars (from the Greek kathari or ‘pure ones’) sought to free people from the material world and restore them to divine purity. They strove to emulate Christ but denied his divinity, and their interpretation of many biblical texts collided head-on with orthodox Roman Catholic teaching. The Cathar Church was essentially comprised of ‘Parfaits’ (Perfect Ones) or ‘Bonhommes’ (Good Men or Women), and ‘Croyants’ (Believers) and essentially sought to restore what they understood primitive Christianity to be. Reacting against the decadence of the Roman Catholic clergy, the austere Parfaits embraced poverty, chastity, patience and humility. The Cathars rejected the traditional Roman Catholic sacraments of baptism and marriage, and adopted different customs and attitudes towards financial and commercial matters. Their beliefs, way of life and simplistic religious rituals challenged Roman Catholic thought, attracted a growing interest and support from ordinary people, but ultimately led to a violent reaction from Roman Catholic clerics. The question has been raised, ‘Were the Cathars really heretics … or were they, in fact, the first Protestants?’ Undoubtedly they were heretics, in that they denied the divinity of Jesus Christ, but there is nevertheless much about their lifestyle to be admired. It is in this latter sense that they could be described as the ‘first Protestants’. They ‘showed up’ the decadence that characterised much of Roman Catholicism at that time, and challenged many of the things that Roman Catholicism stood for. Their ‘godly behaviour’ and simple but profound lifestyle attracted an ever growing following which increasingly undermined support for the Roman Catholic Church. Although tolerated initially by the Roman Catholic Church – in the way Roman Catholicism is able to absorb most things one way or another – the Cathar Church soon became the object of intense persecution. In 1208 Pope Innocent III launched the first Albigensian Crusade – the only time the Roman Catholic Church declared a ‘crusade’ against fellow professing Christians – and thus launched a ‘holocaust’ that was to last for many years until the Cathars in the Languedoc region were finally wiped out in 1243. 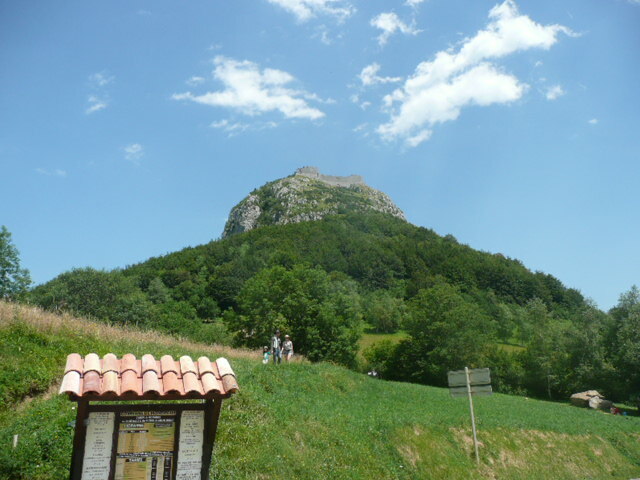 Montségur crag was the setting for the final episode of the Albigensian Crusade, and vividly recalls the CatharChurch holocaust with the ruins of a castle perched on this high rocky peak Julia and I are climbing on a hot sunny day in July 2013. For me it is something of a personal pilgrimage. Although I know that the Cathars were indeed ‘heretics’ – not least in their theological beliefs about the nature of God, the dualist concept of life, and their understanding of the Person of Christ (not to mention their belief in reincarnation or their hope to eventually regain their status as ‘angels’ lost in Lucifer’s rebellion) – there is much about their lifestyle and concern to rediscover the simple purity of early Christianity that I admire. In many ways they are the forerunners of that ‘third force’ at the heart of the later 16th century Protestant Reformation – the Anabaptist Movement – although thankfully our Baptist-Christian forefathers managed to retain orthodox Christian theology to go with the radical Christian lifestyle they espoused. In 1243 the fortress at Montségur was occupied by 100 men under the command of Pierre-Roger de Mirepoix, and beyond its ramparts lived a community of Cathar refugees. The fortress was besieged by a Roman Catholic army of 10,000 men. After a long siege the garrison surrendered and were spared, but the 207 or so Cathars were all burned at the stake at the foot of Montségur. A memorial stone marks the exact spot today. Fascinatingly, four of their number apparently climbed down the steep precipice on one side of the rocky crag on which Montségur is perched during the darkness of the night before the final surrender of the last of the Cathars, and made their escape, taking with them ‘the treasure of the Cathars’ … whatever that ‘treasure’ may have been?! Eventually, Julia and I make it to the top of Montségur. The views are amazing and well worth the hour’s steep climb alone. It is very evocative for me here actually standing where these amazing people stood nine centuries or so ago. I find a quiet corner and sit prayerfully thinking about those last Cathars. What they stood for, and how they must have felt before finally taking the steep descent to what they knew to be certain death – a martyrdom that they received calmly, even joyfully, if the records are to be believed. Hopefully Julia and I will be able to return to ministry soon and help others to Christ-centred, faith that marked out the New Testament Church. After we have explored every nook and cranny of Montségur, and spent time prayerfully contemplating the significance of this extraordinary place and these extraordinary people, we begin our descent. It only takes us about 30 minutes to get back down the steep paths again. Half way down we meet what we perceive to be fellow Brits struggling up the steep path to the top. ‘How much further is it?’ they ask us breathlessly. We hear their Irish lilt. ‘Its only another 10 minutes to the top!’ we reply … encouragingly!